In times of unprecedented speed and complexity of change, a leader’s ability to think strategically, respond quickly, communicate clearly, and do more with the same amount or fewer resources is required for success. More and more I hear leaders asking for support in building capacity to reduce the amount of tactical activity in which they are engaged. One way we are working with leaders to build capacity and lead more strategically is through the development of the art of delegation versus the act of delegating. The art of delegation requires intentionality in considering how we delegate work. Let go of old habits and practice self-awareness. Leadership is an inside job. You must be willing to reflect on your own strengths and come to grips with the assumptions you make about delegating. Be deliberate. 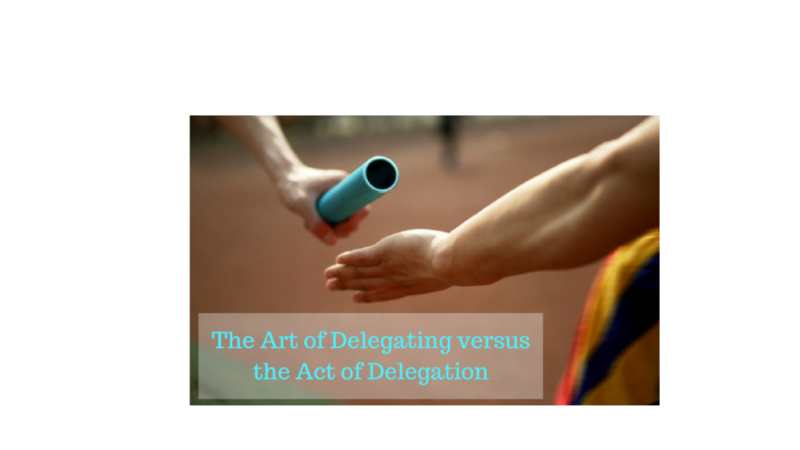 The art of delegation requires intentionality in considering how we delegate work. As human beings, we want to engage and contribute in meaningful ways. A 2012 Gallup poll reveals that only about 25% of employees are truly “engaged” in what they do. Additionally, well over one-third of workers indicated they do only the minimum expected to get by on the job. How do we delegate and increase the level of engagement to increase capacity? To build capacity for themselves and their teams, successful leaders are beginning to think differently about “the who.” Inspirational leaders are better leveraging the strengths and tapping the interests of those they are leading. Instead of automatically doing the work themselves or thinking first about who has the time so they can get it off their plates, effective leaders are considering who has the talent. Who has the strengths and interest for this work? Who might benefit from this work as a development opportunity resulting in increased capacity for the individual and the team? How can I broaden the lens to include people from other parts of my team or even other teams? Thinking more broadly about talent results in strategy being executed more effectively and with greater levels of engagement along with work being done and goals being realized more efficiently. Additionally, team members are building broader networks and relationships that can be tapped for future work. Provide a well-defined description of what they want. Describe the form in which they want the work. Share the context for who will use it and how it will be used. Communicate the scope of decision making authority of those to whom they are delegating. Let go. They provide the agreed upon timing and space for others to complete the work. Check for and check in. Check for understanding to ensure context and expectations have been clearly communicated and received. Check in periodically on progress and to provide support. Recently, I had the opportunity to work with a leader, Alison, who was moving from an internal role to an external facing role. In this new role, she was asked to lead the efforts in building a new part of the business. I asked Alison what the three most valuable aspects of the coaching process were for her. She immediately stated that one valuable aspect was learning to shift her mindset and behavior relative to delegation. Through the art of delegation, Alison is no longer focused on how she can just get things off of her plate. She is now intentionally delegating to better leverage and develop the talent of her team. This approach has allowed her to build a stronger team, free her time to grow the business while strengthening her contributions to the strategic direction of the broader organization. Through the art of delegation, Alison’s capacity to be engaged in broader strategic work has grown because she has developed a team that is now capable of doing more. The number of people on the team that can lead the pursuit and proposal efforts has grown. The results in the marketplace and corresponding increase in revenues for the organization are significant. She is becoming known for her role as a trusted advisor to her clients as well as to her peers relative to providing global perspective and insights. In addition to her results in the marketplace, Alison has increased her impact internally as well. She has been named to a strategic committee of the organization. She now sponsors an internal program for leadership development and is working as part of a team charged with shaping the long term strategic plan for the broader business. Leaders who delegate with intention are doing more than just getting tasks off their plate. They are not only building capacity for themselves but for their teams as well. Everyone is getting the opportunity to stretch themselves, experience greater levels of engagement and fulfillment and are contributing at levels that make a significant difference both in the marketplace and for their organizations.